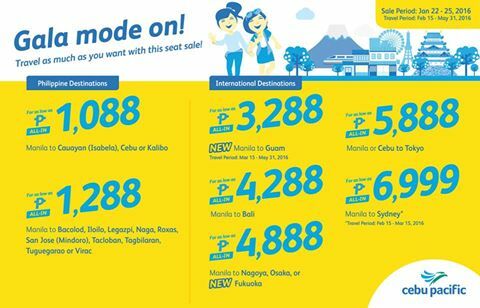 Piso Fare 2016: Travel now with some of the domestic flights on promo based form MANILA. You can go check on Cauayan, Cebu or Kalibo this summer! And if your trip is southeast Asia, then you can check Bali or visit Guam for the very first time at a very cheaper fare. Or been dreaming of Tokyo? Check the place too. Pls update me if there is a promo? Pls. Update me if there is a promo?